Unsourced buzz has surfaced across major media outlets this week that Joe Biden may be preparing to enter the 2020 presidential race. This kind of buzz typically comes from the candidate, and is a method of laying the groundwork before making an announcement. I’m taking this as a sign that Biden wants to run, and that if the support is there, he will run. If he wants to run I think he absolutely should. I’m not saying he should necessarily be the nominee, mind you. Ordinarily, I wouldn’t want someone running for President who would be taking office at the age of seventy-eight. But these aren’t ordinary times. America has been fighting a war against Donald Trump and Russia for the past two years, and while America has certainly gained the upper hand of late, the reality is that we’re still trying to drive Russia out of the White House. We can’t afford not to have our best Generals on the field. Joe Biden is, on paper, the most qualified candidate. That said, it should be up to Democratic voters to decide if Biden is what they want in 2020 after Donald Trump has been ousted. We’ll need someone with the skills, toughness, political savvy, and leadership qualities to piece the nation back together. Biden fits that description. So do a number of other people who are either current or rumored 2020 Democratic candidates. One thing to keep in mind that Joe Biden’s very long record in politics means that the Republicans, and the less scrupulous ratings-hungry members of the media, will have more to work with in terms of creating phony scandals about him. But every Democratic candidate gets hit with phony scandals. Elizabeth Warren was only in politics for five minutes before the Republicans invented the phony scandal about her heritage. The GOP is already surely mining Kamala Harris’ record in California, and Julian Castro’s record in San Antonio, to see what they distort and misrepresent about them. Even if a Democratic candidate doesn’t currently have “baggage,” that’ll soon change, once the GOP and the media begin making things up about them. Back in 2016, I publicly encouraged Joe Biden not to run – but those were very different circumstances. He had already (totally understandably) delayed making a decision until the last minute, as he dealt with the loss of his son. By that time the race had begun moving on without him, and my view is that no one should run for president unless they’re 100% sure their heart is in it. At that point polling also made clear that Biden was never going to catch Hillary Clinton, which would have meant that he’d have been running for nothing. The 2020 race is an entirely different beast. This time around the only thing the polling makes clear that voters have no idea yet whom they want for their next nominee or president. This is an open field. If Joe Biden truly wants to run, he should do it. 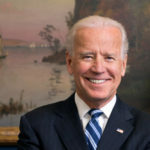 Democratic primary voters should have the option of choosing Biden, who has the most Oval Office experience – or to not choose him, if they ultimately decide some other Democratic candidate is more suitable.